Welcome to my web site! Here you will find a representative sampling of my work in painting, drawing and photography. I hope you see some things you like, and perhaps look at some things in a way you hadn't before. I believe that the greatest contribution an artist can make is the gift of sight to others. Just as a writer weaves a beautiful tapestry of words, and the culinary artist combines bold and subtle flavors which surprise and delight us, so the visual artist works with the elements of design to give us a vision of things which we may have never noticed or considered. Over the centuries, these visions have encompassed everything from sublime spirituality to edgy social justice, from the harsh violence of war, to the quiet aesthetic of the landscape. Would the world remember the cruel, cold, precise bombing of the innocent Basque town of Guernica if Picasso had not memorialized it for us? Who would have seen all of the soft colors of the rainbow in a haystack if Monet had not shown us? Additionally, a carefully crafted sense of timelessness within the image ensures that the work will remain relevant throughout the ages. Guernica speaks to us of the brutality of war, and we understand it, even if we have no notion of the politics of Franco and Hitler. 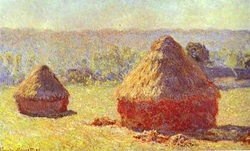 Monet’s Haystacks impart a stunning beauty in a very mundane subject, and we are captivated by it, even though mechanized farming has removed them from our own experience. For more than twenty years my work has focused on the landscape, its expanses and its intimacy, its subtle and dynamic beauty, the play of light, shadow and color, throughout the changes of the seasons. The landscape offers unlimited possibilities in subject, and great variety within those subjects. Simply studying the changes in light and color over the course of a day, a month, or a season is engaging enough to keep me painting until I can no longer hold a brush. My most recent series of paintings explores the beauty and variety of landscape found in the Missouri River Valley. The diversity of this landscape in which I live is profound, and I believe that a landscape artist such as myself could spend a lifetime exploring its subtleties without growing bored with it. Everything from the lay of the land to the lighting above, and the way in which the changing atmosphere affects the color and contrast stimulates my creative instincts. Recently, a fellow artist and colleague paid me the highest compliment by telling me that although he has lived a large portion of his life here, he had never considered the landscape particularly beautiful. However, after looking at several of my paintings, he has taken a new interest in the local countryside, and now sees an aesthetic which he had previously missed. This comment touched right at the heart of my primary goal as an artist: to show others the beauty and dynamic which they may have missed, and to help others find beauty where they had not looked for it in the past. Observations such as these presented here inspire me to continue my work.